(Family Features) It may sound contrary to your healthy eating plan, but the human body actually needs some types of fat for heart and brain health. One common source is cooking oil, such as olive oil. Of the cooking oils most commonly used in North America, such as olive oil, canola oil, peanut oil and various vegetable oils, olive oil contains the most monounsaturated fat, which is widely recognized for its potential role in reducing the risk of coronary heart disease. In fact, beginning in 2016, olive oils will display the American Heart Association’s Heart Check-Mark* to alert consumers about olive oil’s heart-healthy benefits. 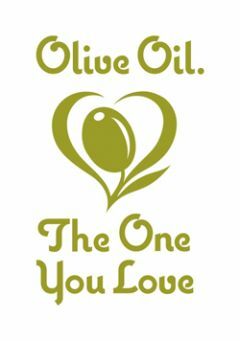 Experience the distinctive tastes of different varieties of olive oil in these delicious dishes and find more heart-healthy recipes at AboutOliveOil.org. Heat medium sized saute pan on high. Add olive oil and heat. Salt and pepper cod. Add cod to hot oil and sear very hard on one side, until fish is golden brown and crisp. Transfer cod to baking sheet that has been brushed with olive oil. Place cod in oven until it starts to flake, about 12 minutes. Remove cod from oven and keep warm. Using spoon, portion Olive Oil Melted Tomatoes onto four large dinner plates. Allow some flavored oil to puddle on plate. 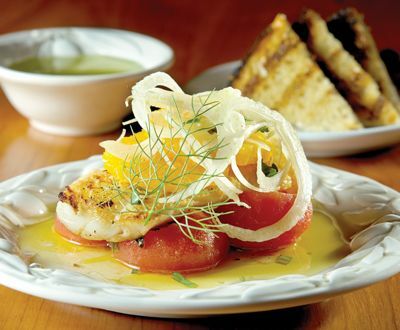 Carefully transfer cod on top of warm tomatoes. Then top cod with Orange, Fennel and Olive Oil Salad. Squeeze lemon wedge over entire plate. Place tomatoes in 9-inch cake pan and season to taste with salt and pepper. Scatter herbs, lemon zest and garlic on top of tomatoes. Drizzle tomatoes with extra-virgin olive oil, which should come up about three-quarters of the way on tomatoes. Cover with foil and bake until tomatoes are tender, approximately 40 minutes. Combine all ingredients and gently toss just before garnishing cod. 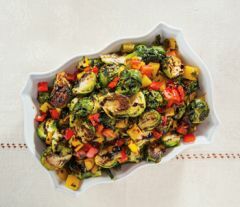 Combine Brussels sprouts with all ingredients except peppers and balsamic syrup. Toss Brussels sprout mixture and season to taste with salt and pepper. Transfer mixture to sheet pan and roast in oven for 15 minutes. Stir sweet peppers into mixture and roast 5-10 minutes more. Remove from oven and place on serving platter. Drizzle with balsamic syrup and serve immediately. Beat eggs with water, then beat Parmesan into egg mixture and reserve. Combine garlic, shallots, potato, pepper, parsley and basil, and set aside. Heat extra-virgin olive oil in 12-inch non-stick saute pan over high heat. Add mushrooms and saute until they start to brown. Reduce heat to medium and add reserved vegetable mixture. Saute for about 1 1/2 minutes. Season with salt and pepper, to taste. Add additional olive oil, if needed, then add reserved egg mixture to hot saute pan. Cook 2-3 minutes until egg cooks and sets on bottom. Transfer saute pan to broiler and broil until light and fluffy, and almost totally set, about 2-3 minutes. 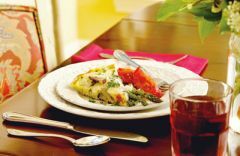 Sprinkle fontina cheese on top of frittata and place back under broiler until melted, about 2-3 minutes. Remove to cutting board and cut into six triangle servings. Place one serving in center of plate. Garnish each portion with four stalks of Lemon, Basil and Garlic Roasted Asparagus and two wedges of Roasted Tomato. Sprinkle each portion with Parmesan. Combine parsley, lemon zest and garlic. Set aside. Place asparagus on sheet pan in one layer and drizzle with olive oil. Season with salt and pepper. Roast 15-20 minutes. Sprinkle with parsley mixture and place back in oven for 3-5 minutes. Combine all ingredients in bowl and transfer to sheet pan lined with baking paper. Roast for about 20 minutes, or until done.